The Swedenborg Foundation’s weekly spirituality and faith-focused Swedenborg and Life webcast will host a live conversation between producer and host Curtis Childs and NDE survivor and author of My Descent Into Death Howard Storm on Monday, May 23, 2016 at 8 p.m. ET. Watch as it’s broadcast live on the offTheLeftEye YouTube channel. In the upcoming Swedenborg and Life webcast titled “The Reality of Heaven and Hell,” Curtis and Howard will discuss topics from his best-selling book My Descent Into Death and recent autobiographical book Lessons Learned. Watch online from the comfort of your home computer or mobile device as the two discuss how Howard’s 1985 near-death experience changed him so deeply that he went from being a devoted atheist to a devout Christian minister. 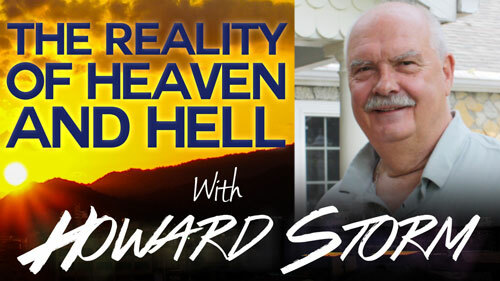 Like Swedenborg, Howard saw both heaven and hell during his experience and shares his story in hopes that viewers will find answers to their own spiritual struggles on the path toward God. The offTheLeftEye YouTube channel explores faith and spirituality through video. Thanks to a dedicated production and writing team located in a small production studio in Montgomery County, PA, the channel has been providing hope and meaning to a worldwide audience since 2010. Creator, producer, and host Curtis Childs became part of the Swedenborg Foundation in 2012, because of their mutual goal to share with the world the work of eighteenth-century spiritual teacher, philosopher, and writer Emanuel Swedenborg. Swedenborg and Life, which streams live every Monday at 8:00 p.m. ET, launched in 2014. The addition of the hour-long weekly web series provided depth to the channel’s preexisting short video repertoire as well as a regular viewing schedule for its 30,000+ subscribers. The Swedenborg Foundation is a 501(c)(3) nonprofit, independent, educational organization and book publisher based in West Chester, PA.